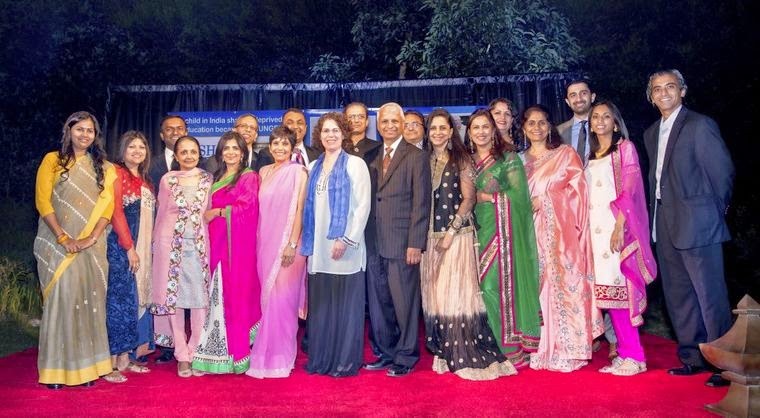 IndiaWest: Palos Verdes, Calif. — A “Summer Formal Diwali Benefit Dinner” organized by Akshaya Patra here Oct. 5 featured guests of honor Gururaj “Desh” Deshpande, Emily Rosenbaum and actor Manish Dayal, star of the highly acclaimed film “The Hundred Foot Journey,” while Shekhar Kapur, director of hugely successful films like “Elizabeth,” made a surprise guest appearance. The program was kicked off by opening remarks by Vandana Tilak, chair for the group’s Los Angeles chapter, followed by an introduction of Deshpande by Mallika Chopra, daughter of Deepak Chopra. The event focused on raising awareness and funds for Akshaya Patra, which has won gold medals in accounting and transparency and their single-minded focus on serving 1.4 million meals every day for 220 school days of the year. More than $500,000 was raised for Akshaya Patra that evening. The presentation by Indian American entrepreneur Deshpande focused on excellence, efficiency and shared prosperity. Akshaya Patra’s ISO 9000 certified kitchens cook for over 100,000 children in a matter of five hours every day in ten states across India and transports food to government schools providing midday meals. Most often that one meal is the only meal of the day for the children, but it is one that makes a difference. The children focus better in class, are strong and take part in athletics. Over the past 12 years, attendance by girl students has increased, and the number of children going to work in factories and farms has been reduced. It takes only $15.00 to feed a child for an entire school year after public and government subsidies. Ninety percent of Akshaya Patra’s budget is raised in India, while only ten percent of the funds are raised in the U.S. and the UK. Kapur spoke about the very subtle separation between living a life of entitlement and opening the heart to see what is around us. The 200 guests enjoyed dances on stage by the Nrityodaya Kathak Academy and Vinaini Jayasinghe of Savitri Arts Academy. Ravi Tilak summarized the intent of the evening by sharing the definitions of Prakruti, Vikruti and Sanskruti. At a high level, Prakruti is when you are hungry and you eat what you need. Vikruti is when you are hungry and you eat more than you need. Sanskruti is when you are hungry, and you eat, but you also leave some for someone else in need, he said. With this latest fundraiser, which was emceed by Sailesh Ranchhod, Akshaya Patra seems to be well on its way to reaching its goal of feeding 5 million children every single day by 2020.